High Pressure Screw Connect Coupling has been designed for applications involving the transmission of corrosive fluids and/or operation in corrosive environments. They can operate at very high pressures and cope with severe pressure pulse conditions. 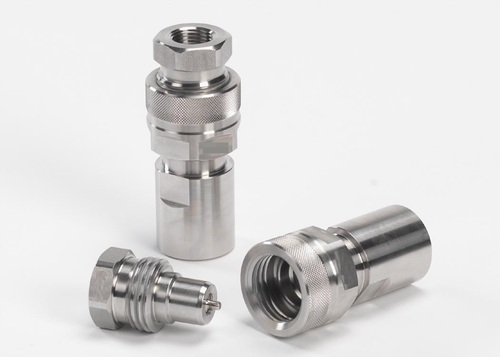 Very high-pressure pulse applications where a quick connect coupling is not usually suitable, corrosive environments. The PTS Series is available in carbon steel, Trivalent plated and with nitrile seals. In this configuration it is designated the PTC Series. Established in the year 1993, we, "Fairtech Engineers", are considered to be one of the leading manufacturers, suppliers and traders of the best quality of Industrial Products. We offer a wide range of products such as Screw Couplings, ISO Couplings and Flat Face Couplings. For the purpose of manufacturing the offered industrial products in compliance with the industry laid norms, the offered latest machinery and quality assured materials. Owing to their accurate dimension, sturdy construction, seamless finish, high tensile strength and longer serving life, these industrial valves are used in various industrial applications. Rendered by us at industry leading prices, the offered industrial products are highly appreciated among our customers. Since the inception of the company, we have been backed and supported by a team of skilled professionals. Boasting by the skills, knowledge and experience of this domain, we have been able to attain a commendable position in this domain. They are provided with regular training sessions, to enhance and polish their skills in the most efficient manner.